Eastern Orthodox and Roman Catholics have many similarities. It can be argued that the two communions share much in common concerning of the Trinity, Scripture, Redemption, the Sacraments and Eschatology. The obstacles remaining between the two ecclesiastical bodies, however, are profound, and result in a lack of Eucharistic communion. These obstacles will be explored in brief, beginning with the Filioque controversy. In dealing with this matter, there will be an examination of the history of the Filioque controversy, agreements, disagreements and possible solutions. This will be followed by a related obstacle, known as papal primacy, which will be analyzed by examining the Roman Catholic perspective, the Eastern Orthodox view and then addressing a path to a solution in regards to the papacy debate. The history of the Filioque controversy is very complex. One could devote numerous pages to the historical aspects of the dispute, let alone the theology behind the doctrine itself. As our purpose is to analyze the obstacles to full unity between the Roman Catholic and Eastern Orthodox Christians, a short overview of the history of the Filioque is in order. This will be followed by an exposition of the Roman Catholic understanding of the Filioque. After examining the Roman Catholic view, the Eastern Orthodox view will be presented. Lastly, possible solutions to the Filioque dispute will be explored. The term “Filioque” is simply Latin for “and of the Son” and it refers to a term added to the original Nicene-Constantinopolitan Creed of 381. The Filioque doctrine can be expressed as “the Holy Ghost proceeds from the Father and from the Son as from a Single Principle through a Single Spiration”. Meaning, the Spirit has His source eternally from the Father and from the Son, as from one source. Though it does not appear, at first glance, to be controversial, it is, in fact, a major area of dispute between Roman Catholics and Eastern Orthodox. During the first millennium, it was the main obstacle to full unity between Roman Catholics and Eastern Orthodox. At the time of the Council of Florence, it was the main issue debated. Even as late as 1864, the Patriarchs of Constantinople, Alexandria, Antioch and Jerusalem spoke of it as one of the most significant issues between the two communions, calling the Filioque a “heresy”. In the West, the earliest version of the doctrine can be found in the ecclesiastical writer Tertullian. Other Latin writers, such as St. Hilary of Poitiers also speculated on the matter. However, the figure who established the doctrine, particularly in the West, was none other than St. Augustine of Hippo, in his famed work De Trinitate. In 1014 A.D., under pressure from the emperor, the Filioque was inserted into the creed in Rome by Pope Benedict VIII, completely reversing the policy of previous popes. Having what could only be assumed to be papal sanction, the Filioque became common in the West. In the East, the insertion of the Filioque into the creed by Rome was a major point of contention, contributing significantly to the schism of 1054 A.D. In fact, it remains a major point of contention between East and West today. Some of the disagreement on the Filioque involves differences in terminology. In Greek, there are two words for procession, which distinguish between the economical and theological. The Greek word ekporeusis, in the verbal form, refers to a “’passage outwards’ from within some point of origin” and is primarily used in the context of the theology of the Trinity. This is distinct from the Greek word proienai, which means “go forward” and is restricted to the economy of salvation. In Latin, however, there is only one word used to refer to the economical and theological, and it is processio, which is translated as “movement forwards”. Since the term is used in both economical and theological instances, it often led to serious confusion. A possible solution to the language difference can be found in a saint common to both communions. Quickly recognizing the differences in terminology, the saint sought to clarify the matter in his Letter to Marinus of Cyprus. Simply listening to this common witness of tradition should be sufficient to clarify the terminological issue. The equality of the Spirit with the Father and the Son is firmly maintained by both East and West. This is to say, the person (hypostasis) of the Holy Spirit is not to be considered inferior to either the person of the Father or the Son, regardless of the position one takes on the Filioque. Thus far, Roman Catholics and Eastern Orthodox both clearly agree in Trinitarian matters. However, some in the East, taking after Patriarch Photios, maintain the Filioque leads to diminishing the Father’s role in the Trinity, namely His monarchy. While, the West tends to assert that a denial of the Filioque leads the conclusion that the Son is indistinguishable from the person of the Spirit. Views such as these lead to controversies, where each side accuses the other of having a distorted view of the Trinity. A possible solution here is to simply recognize neither side wishes to compromise the monarchy of the Father, or to conflate the Son with the Spirit, and for each to consider how the other side is able to resolve their apparent difficulties. Both Roman Catholics and Eastern Orthodox agree that when Scripture speaks about the Son sending the Holy Spirit, it is in reference to the economy of salvation. Disagreement remains on whether the sending of the Spirit in the economy of salvation can be read back into the theology of the Trinity. It is this latter point, which the West maintains, and which some in the East are hesitant to concede. “What then is lacking to the Spirit to be the Son, for if nothing was lacking to him, he would be the Son? – We say that nothing is lacking to him, for nothing is lacking to God; but it is the difference in manifestation, if I may say so, or in the relationship between them which makes also the difference in what they are called”. Elsewhere, St. Maximus the Confessor recognizes such as relationship, affirming that the Spirit is “through the Son”, saying, “[b]y nature the Holy Spirit in his being takes substantially his origin (ekporeuomenon) from the Father through the Son who is begotten”. Thus, there should be no hesitancy among some in Eastern Orthodoxy in affirming that what is read in Scripture, when referring to matters of economy, can be read back into the Theology of the Trinity. The theological problem, ultimately speaking, is not that there is an eternal relationship between the Son and Spirit, but whether the procession of the Spirit is from two persons as from a single source. Revisions of the Nicene-Constantinopolitan creed is not absolutely a point of contention between Roman Catholics and Eastern Orthodox. Both in theory agree additions can be made, it is just how the additions are made that is disputed. Roman Catholics believe the Pope has the authority to unilaterally insert additions into the Creed, as can be seen in the Summa Theologica. Eastern Orthodox, however disagree with such an act made by the Pope and denounce the Popes who “changed the ancient worship at will” (i.e. without the consent of an ecumenical council). In fact, the Eastern Orthodox would be quick to note the Council of Constantinople 879-880, which was “confirmed by Pope John VIII,” anathematized any addition to the Creed without serious reason for such a change, as noted above. A possible solution to this issue, proposed by the North American Orthodox-Catholic Consultation, would be for the West, while still maintaining the doctrine, to immediately cease saying the Filioque in liturgical settings. During the reunion council held in Florence, the council devoted nine months to the Filioque debate, while only dedicating two weeks to the issue of the papacy. In that time, the Filioque was considered the only real essential issue between Eastern Orthodox and Roman Catholics. Now, however, the main issue between the two communions is papal primacy. This is a natural progression, given that the Filioque leads to the debate on the papacy, as the issue of the Filioque is ultimately about whether Rome has the authority to change the Creed and make dogmatic decisions apart from an ecumenical council. Thus, the matter of the Filioque essentially boils down to the debate on the papacy, which will be explored in the paragraphs below. Roman Catholicism dogmatically understands the doctrine of papal primacy to mean “the Pope possesses full and supreme power of jurisdiction over the whole Church, not merely in matters of faith and morals, but also in Church discipline and in the government of the Church.” According to the Congregation for the Doctrine of the Faith, this doctrine is considered a “divinely revealed” truth, and requires on part of Roman Catholics “the assent of theological faith”, under pain of heresy. This means, the view that the Roman Pontiff has universal jurisdiction, not only in matters of doctrine, but also in matters of discipline, is an essential doctrine which is “irreformable”. In other words, the Roman Catholic Church is not able to change this view, as it maintains it is divinely revealed by God. The Roman Catholic Church believes this understanding of Papal primacy for many reasons. The most prevalent reason is because, according to Roman Catholicism, Jesus “appointed Peter to be that head of the Church; and He also determined that the authority instituted in perpetuity for the salvation of all should be inherited by His successors, in whom the same permanent authority of Peter himself should continue.” It is this same authority given to Peter that Pope Leo XIII believed included “the power of commanding, forbidding, and judging, which is properly called jurisdiction.” Meaning, Christ established Peter as the head of the Apostles and the church, gave to him universal power of jurisdiction, which is passed on to his successors (i.e. the bishops of Rome). Therefore, Roman Catholicism believes, the Pope has “full and supreme power of jurisdiction over the whole Church”. The Pope is able to hear appeals in disputes between local churches, particularly in the manner provided for by the Synod of Sardica in the 4th century. The Pope is able to “promote the communion of all the local churches”. The Pope is able to call and oversee synods and ecumenical councils. The Pope is able to provided “doctrinal guidance” to those who request assistance on such matters. All of these can be affirmed by Eastern Orthodox, especially in the context of a church in which Roman Catholics and Eastern Orthodox are in full communion. What Eastern Orthodox reject concerning the papacy is the notion the bishop of Rome has universal jurisdiction over all local churches, primarily because it interferes with “the affiairs of a local church and this means the destruction or negation of its catholicity and ecclesial integrity.” This is so because Eastern Orthodox maintain an ecclesiology which sees the local church, with the local bishop at the center, as containing the fullness of the church. Additionally, the Eastern Orthodox would claim in the first millennium, the East generally did not believe in the universal jurisdiction of the papacy, which is why the noted Protestant scholar, J.N.D. Kelly maintains the East in the early church did not see Rome has having universal jurisdiction. The Eastern Orthodox would also be quick to note the Roman Catholic delegates, as part of the Joint International Commission for Theological Dialogue between the Roman Catholic Church and the Orthodox Church, affirmed “the bishop of Rome did not exercise canonical authority over the churches of the East” in the first millennium. In other words, it does not see, in the canonical tradition of the first millennium, the claims of the papacy, especially those made at the First Vatican Council. Consequently, granting universal jurisdiction to the Pope, for Eastern Orthodox, is inconceivable for both theological and historical reasons. However, Eastern Orthodox express their need for the papacy today, which truly makes the matter of solving the papacy debate urgent. 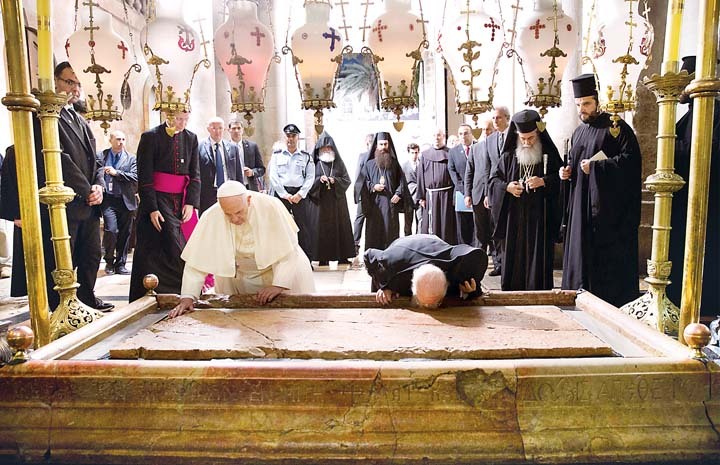 The path to unity between Eastern Orthodox and Roman Catholics remains difficult. Many differences remain, especially in the matter of the Filioque and papal primacy. These difficulties have been examined by addressing the history of the Filioque controversy, the various agreements and disagreements on the matter, followed by possible solutions. Additionally, an attempt has been made to analyze the Roman Catholic view of papal primacy and the Eastern Orthodox view of papal primacy, followed by an examination on how Trinitarian doctrine can contribute to a solution on the debate. Ludwig Ott, Fundamentals of Catholic Dogma, (Rockford, Ill: Tan Books and Publishers, 1974), 62. Jaroslav Pelikan, The Spirit of Eastern Christendom (600-1700), (Chicago: University of Chicago Press, 1974), 183. Encyclical of the Eastern Patriarchs, 1848. A Reply to the Epistle of Pope Pius IX, “to the Easterns”, available online: http://sourcebooks.fordham.edu/halsall/mod/1848orthodoxencyclical.asp, accessed 17 April 2017; 5 xv. John Anthony McGuckin, The Westminster Handbook to Patristic Theology, (Louisville, Ky. [u.a. ]: Westminster John Knox Press, 2006), 145. It should be noted the Eastern Fathers, when using such language, were not affirming the Filioqe, but speaking about the economic mission of the Holy Spirit. See McGuckin, 145. Bernd Oberdorfer, “The ‘Filioque’ Problem – History and Contemporary Relevance”, Scriptura. 79, no. 1 (2002): 83.
http://www.newadvent.org/fathers/33041.htm, accessed 17 April 2017; 1, 8. F. L. Cross, and Elizabeth A. Livingstone, The Oxford Dictionary of the Christian Church, (Oxford: Oxford University Press, 1997), 611. North American Orthodox-Catholic Theological Consultation, “The Filioque: a Church-Dividing Issue?” SOBORNOST, 26 (2004): 40. George Dragas, “The Eight Ecumenical Council: Constantinople IV (879/880) and the Condemnation of the Filioque Addition and Doctrine”, The Greek Orthodox Theological Review. 44, no. 1-4 (1999): pp. 357-369. J. N. D. Kelly, The Oxford Dictionary of Popes, (Oxford [Oxfordshire]: Oxford University Press, 1986), 140. North American Orthodox-Catholic Theological Consultation, The Filioque, 41. Pontifical Council for Promoting Christian Unity, The Greek and Latin Traditions Regarding the Procession of the Holy Spirit, available online: https://www.ewtn.com/library/CURIA/PCCUFILQ.HTM, accessed 18 April 2017. North American Orthodox-Catholic Theological Consultation, The Filioque, 51. St. Thomas Aquinas, The Summa Theologica, 2nd Revised Edition, 1920, trans. Fathers of the English Dominican Province, http://www.newadvent.org/summa/, accessed April 2017, I, 36, 2. Pontifical Council for Promoting Christian Unity, The Greek and Latin Traditions Regarding the Procession of the Holy Spirit. Aquinas, ST, I, 36, 2. Encyclical of the Eastern Patriarchs, 6. Francis Dvornik, “Which Councils Are Ecumenical?” Journal of Ecumenical Studies, 3 (1966): 315. North American Orthodox-Catholic Theological Consultation, The Filioque, 59. Adam A. J. DeVille, Orthodoxy and the Roman Papacy: Ut Unum Sint and the Prospects of East-West Unity, (Notre Dame, Ind: University of Notre Dame Press, 2011), 22. North American Orthodox-Catholic Theological Consultation, “Steps Toward a Reunited Church: A Sketch of an Orthodox-Catholic Vision for the Future”, Origins. 40, no. 23 (2010): 353-359, 2. For a brief summary, see Pope Leo XIII’s papal encyclical entitled Satis Cognitum. http://w2.vatican.va/content/leo-xiii/en/encyclicals/documents/hf_l-xiii_enc_29061896_satis-cognitum.html, accessed 17 April 2017; 11. North American Orthodox-Catholic Theological Consultation, Steps Toward a Reunited Church, 7. Mshanga, Vitalis. “You Are Peter: A Critical Analysis of the Orthodox View of Papal Primacy in View of an Alternative Way of Exercising Papal Primacy”. Journal of Ecumenical Studies. 45, no. 1 (2010): 130. J. N. D. Kelly Early Christian Doctrines, (London: Adam & Charles Black, 1960), 407. Joint International Commission for the Theological Dialogue Between the Roman Catholic Church and the Orthodox Church, Synodality and Primacy During the First Millennium: Towards a Common Understanding in Service to the Unity of the Church. Available online: http://www.vatican.va/roman_curia/pontifical_councils/chrstuni/ch_orthodox_docs/rc_pc_chrstuni_doc_20160921_sinodality-primacy_en.html, accessed 18 April 2017; 19. Robert George Stephanopoulos, “Christian Unity and the Petrine Ministry: Remarks of an Orthodox Christian”, Journal of Ecumenical Studies, 11 (1974): 314. Catechism of the Catholic Church (hereafter CCC), http://www.vatican.va/archive/ccc_css/archive/catechism/p1s2c1p2.htm, accessed April 2017, 248.
http://w2.vatican.va/content/john-paul-ii/en/encyclicals/documents/hf_jp-ii_enc_25051995_ut-unum-sint.html, accessed 17 April, 2017; 94.